3.87 points at 15 votes (rank 824). 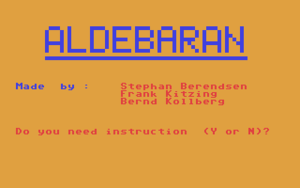 Rombachs C64 game guide 5 September 1984 - "Judgement 4"
During a disaster in a bio laboratory of a spaceship in 2160 bacteria of the Aldebaran Systems are set free. The lives of the nine scientists of the bio laboratory are in danger. 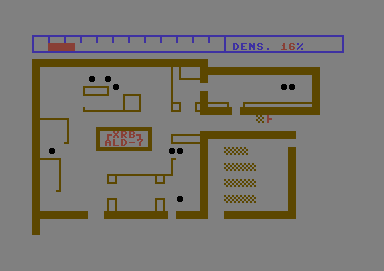 The task of the player is - by using a remote-controlled robot - to bring the scientists into the upper right room and to avoid the spread of the free bacteria by sealing the lab rooms at seven places before the indicator at the upper rim of the screen reaches 100%. When all tasks are fulfilled, the "Return" key needs to be pressed. The less time one needs, the more points are given. 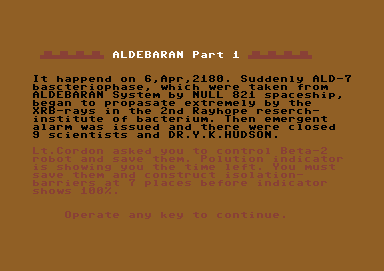 The game description is only readable with great effort, as it is partially depicted with blue/red writing on an orange background. The bio laboratory, the insulating material and the robot are created with the help of commodore graphics signs. The sound is without relation to the game. There is only one level. The program is self-explanatory. A demonstration is started approx. one minute after the start of the game. The robot can only push, not pull. The scientists. They need to be brought into the upper right room. The barriers. They need to be pushed in front of every entrance. The robot "Delta 2". This is controlled by you. As you can pull neither the scientists nor the barriers, you must never push them into a corner as you then don't have any possibility to get them out there again. 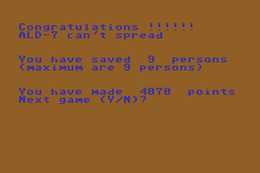 Rombachs C64-Spieleführer: "The idea of the game is quite inventive, but the design is not very impressive. The assigned task is easy to fulfill with the joystick. It is rather interesting to play against time, see the demonstration for comparison. Judgement: 4"
Sledgie: "The game reminds me of a Boxes-like game. But in Aldebaran time is an important faktor. Additionally the illustration is reduced to symbols. Due to the Basic coding the movements look a bit bumpy. Altogether I gave the game 5 points." Blubarju: "An interesting version of Sokoban. The simple makeup is no skin of my nose, but the game is played to the end quickly and after that palls. But for the good idea of the game I give 5 points." mombasajoe: "Oh, well. The level designer was ill and the graphic artist was on holiday. Astonishing, that this game is given attention in Rombachs Spieleführer. Was it released commercially?" 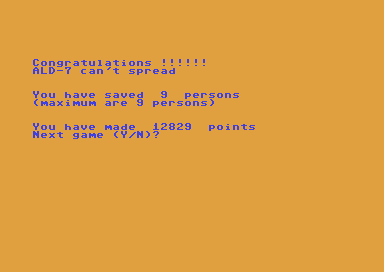 H.T.W: "Not bad for a BASIC programme. Also the calculation of the score (score = men x (int(100-percentage bar)+100) + exits to x (int(100-percentage bar)+50) + bonus points for all men and all exits - number of moves) is basically ok. It is only that there are a few version in circulation where line 225 is not complete and so the bonus points are calculated the wrong way. 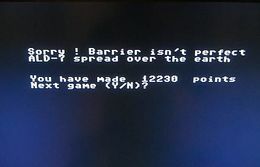 You find the fixed version in the Forum64 (see Links).